Wall Street continues to eye higher education investments as a new way to increase their bottom line. As college costs increase and students go further into debt, Wall Street has made a killing on profits from higher education spending while students and taxpayers foot the bill. 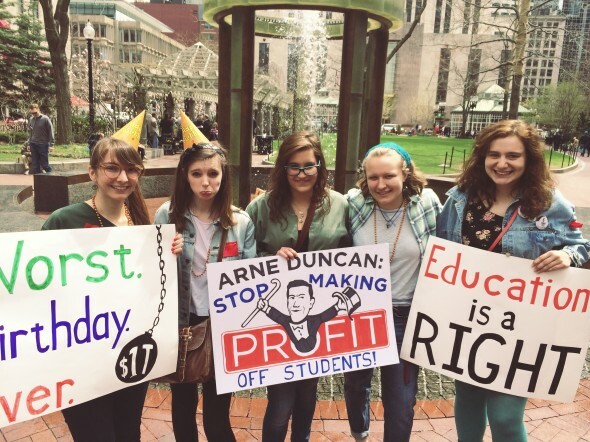 Below are some shocking ways that Wall Street has corporatized higher education across the country. Wall Street rakes in $45 billion on average per year through higher education spending. [i] The three core components Wall Street uses to create profits off higher education are student loans, for-profit colleges and the institutional debt of colleges and universities. In 2012, Wall Street made $34 billion on interest charged on student loans, more than $500 million from for-profit colleges, and $10.5 billion in interest paid by colleges on their institutions’ debt. As recently as 2011, one in every 10 dollars spent on higher education was absorbed by Wall Street through these and other profit-driven schemes. Working families paid $34 billion in interest on student loans in 2012. [ii] As Pell Grants and other need-based financial aid programs shrink to their smallest size since their formation, state spending per student has also reached an all-time low, forcing students to take out student loans to finance their education. Throughout the 2000s, interest rates for private loans increased rapidly, reaching 13 percent in 2006, despite much lower interest rates for the banks borrowing from the federal government. [iii] Following the 2013 federal student loan interest rate compromise, interest rates are now fixed to the 10-year Treasury note,[iv] meaning that the amount paid on interest will increase over time as interest rates rise. Credit card companies paid colleges and universities $270 million from 2009 to 2012. [xxiii] Universities and colleges have signed contracts with financial institutions to issue and promote specific bank credit cards, regardless of the other, better financial options available for students on campus. These contracts grant banks access to over one million students every year, leading them to take on even more debt. The data above paints a troubling picture about the priorities of higher education in the United States. Students cannot afford to leave decision-making power in the hands of the reckless 1%, who continue to target higher education as their next business conquest. The crisis is real: we must stop Wall Street from raking in billions of dollars on the backs of students. This entry was posted on Tuesday, May 27th, 2014 at 6:48 pm. It is filed under Blog, Featured. You can follow any responses to this entry through the RSS 2.0 feed. Hi, I do think this is a great site. I stumbledupon it I may revisit once again since i have book marked it.